At Dental Health, we can replace damaged or missing teeth with permanent, durable dental implants in Saddle Brook, NJ. Our expert implantologist, New Jersey Board of Dentistry member Dr. Steven Goldstein, places single dental implants, or can perform full mouth rehabilitation, placing multiple implants if necessary. 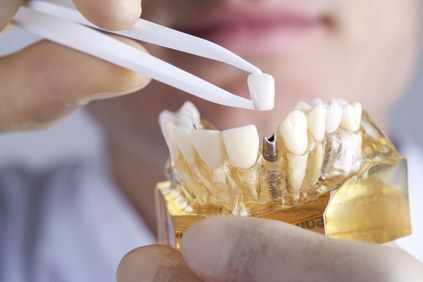 We offer a variety of restorative options, ranging from crowns and bridges to implant supported dentures, all of which are fabricated at our highly regarded partner laboratory. Not only do implants replace teeth like traditional dentures and bridges do, they actually replace the entire tooth root as well. If you are unhappy with the way your dentures fit, implant supported dentures might be an answer. Receiving traditional implants is typically a two-part procedure involving placement and restoration. First, Dr. Goldstein will surgically insert a titanium post into the jaw through the gums. Over a period of several months, the jawbone will fuse with the implant in a process called "osseointegration." Once the treatment area has healed, the implant will serve as an artificial tooth root to which a restoration can be affixed. One of our general dentists, Dr. Mila or Dr. David Paltac, will then restore the implant by securing a crown, bridge, or denture to it. These custom-made restorations will take between ten days and two weeks to prepare at our lab. You will be provided with a temporary restoration while your permanent prosthetic is being fabricated. Because implants fuse with the jawbone, it is extremely unlikely that they will shift or give way under pressure. Dental implants are long-lasting: restorations typically last from ten to fifteen years, while the implants themselves should last a lifetime. Dental implants eliminate inconveniences associated with traditional dentures, such as impaired speech, dentures slipping out of place, dietary restrictions, and denture cleaning routines. Implants strengthen the jaw. When patients lose teeth, the jawbone naturally begins to recede, as it lacks regular stimulation from tooth roots. However, artificial roots provided by implants stimulate the jaw, fortifying it and restoring oral health. With our in-house team of dental specialists, we are uniquely prepared to handle every facet of your dental implant surgery and restoration. Successful implant surgery requires sufficient jawbone tissue in which to place implants. Because of bone degeneration that follows tooth loss, some patients may lack adequate bone tissue. However, preparatory procedures can restore candidacy, including bone grafting and sinus lifts. To help determine your candidacy, we will take a panoramic scan of your oral cavity during your consultation. Dr. Goldstein may also request a detailed 3D cone beam scan of your jaw, which our partner mobile company can perform from the convenience of your home and send to our office. Dr. Goldstein will coordinate treatment with our in-house oral surgeon if he determines that you need a preparatory procedure prior to receiving implants. In many cases, Dr. David Paltac can work with Dr. Goldstein to place All-on-4® implants. This method can stabilize large restorations such as dentures with just four implants, rather than multiple posts – even when a patient has receding jawbone tissue. Placing fewer implants means less surgical time, faster recovery, fewer bone tissue requirements, and greater treatment affordability for the patient. With our in-house team of dental specialists, we are uniquely prepared to handle every facet of your dental implant surgery and restoration. Contact our practice today to schedule a consultation, and begin your journey toward permanently restoring your smile.